She wasn't late, she didn't imbibe with talking caterpillars...she stayed away from rabbit holes and her name was certainly not Alice. 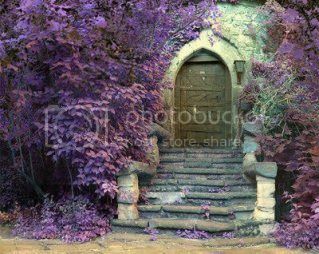 Yet here she stood, twice the size of that silly door which was surrounded by purple foliage. Purple! And nothing around her marked 'Drink Me'. She'd love to blame Bubba for this mishap, but no way was his fourteen year old brain capable of a prank this sophisticated. Unfortunately...it seemed so real. The black and white butterflies flit by her face, sporting suits and ties each carrying cellphones with arms, legs and no head. They dialed themselves and held tight to the owners ears. Maybe this was just a really vivid dream and she would wake up soon. Very, very soon. Oh, cool, that would be a good opening! Even though I know next to nothing about YA novels, still your prose seems right. And I adore that pic.